It has been a long and dry week on the inspiration front. Creativity is muffled, the juices aren’t flowing and the spirit is down. I know we all go through this at times and it’s just a phase, but it takes its toll after a while. Many thoughts go through your head, and one recurring one is, I don’t want to do this anymore. Then the excuses start; I’m too busy, I don’t get paid, it’s too much work, it’s takes too much of my time and so on. Finally, the decision is made, and you are determined this time that you’re done. No sooner have you finished this thought, then the phone chimes to let you know of a new comment from a new blogger friend who is reading through your old posts. Then all hell breaks loose in your head. As tempting as it was to give up and not bother, I couldn’t do that. My blog is a part of me now and if I leave it; I neglect myself. I neglect myself already too much, so I’m not adding my creative outlet to that list because not only will I lose a piece of me, I will lose all the lovely people I’ve come to know because of it. It doesn’t help that I have been unwell but that’s the reality when you live with a chronic illness. The bad days can be bad to the point that nothing is worth the bother and the pain. Your family doesn’t always understand because to them you are invincible, there can never be anything wrong with you. The ones who do understand, are your friends. So, I’ve been getting by with the help of my friends here and absent friends via two hour phone calls. Also, I don’t want to forget my blogger friends who leave such cheery comments. Though they don’t know of my predicament; their words help more than they know. The thought of giving this up was unbearable, so I didn’t. Today’s recipe isn’t very inspirational or original but it was so good, I had to share it. And that’s what it’s about, when I try something and it’s good, my first thought is, I have to tell the others about it. I didn’t intend to share this recipe, it was made for home consumption, but this Pear Blackberry Cake was fantastic. I had made a similar cake a couple of weeks ago with apples and frozen blueberries and that was good too, but this time around I wanted to use a more seasonal blackberry apple combination. When I went to my fridge to get the apple, there were a couple of sad looking pears that needed to be used up. These gorgeous, organic, pears from the Colorado western slopes (available at my local farm stand, Isabelle Farm) are so sweet and juicy but like all pears, they bruise easily and look quite sorry when they’re not used up promptly. I exchanged my apple for the two pears and I have to say, this combination was even better than the last cake. The cinnamon, brown sugar and pecan filling in the middle can be optional, but why would you not have it? It was the best part! When I asked Laith how he liked the cake, he said he loved the pecans. We didn’t eat the cake the day it was made, I was still deliberating taking photos of it and so I let it be. The next day, I went ahead and took the photos, whether I was going to post it or not, and then had a piece. I don’t know if it was letting it sit overnight or what, but the cake was so wonderfully moist and melt in your mouth. The crunch of the pecans, the caramelised sweetness of the brown sugar and cinnamon, it was like a cinnamon bun and cake combined. I hope you utilise the blackberries that are still in the shops right now and the pears that are at their peak also. Use ripe, soft ones, I like Bartlett and those were the ones I had in my fridge. This a great recipe for either a Thanksgiving dessert or for a Thanksgiving morning breakfast or a leisurely autumn themed brunch if you don’t do Thanksgiving. So, on to the recipe; I made my cake in a bundt cake pan just because I wanted a pretty shape but you can use a rectangular pan (9×13) or a 10″ bundt cake pan (large pan). I am pretty sure you can make these into muffins too and add a streusel on top, but I haven’t tried that yet to confirm whether the recipe will work as written. a moist and luscious cake made with fresh Colorado pears, blackberries with a cinnamon, brown sugar and pecan filling. Grease a bundt pan or a 9x13 inch (24 x33 cm) pan with non stick spray or butter and flour. In a bowl, add the brown sugar, pecans and cinnamon. Toss together and put aside. Mix the flours, baking powder and baking soda together in a bowl and keep aside. In a mixer bowl or with a hand mixer, beat the butter, oil and sugar until light and fluffy. Add the sour cream and mix until blended. Add the eggs, one at a time, till just mixed. Add the flour in batches until well blended. Don't over beat the cake. Fold in the pears and blackberries. Spread half the cake batter into the pan and then sprinkle the cinnamon sugar peach mixture. You can use a knife and swirl gently. Add the rest of the batter over the top. Bake in the centre of the oven for at least 45-50 minutes. Check at 45 minutes and let bake if still wobbly or if knife inserted comes out gooey. It may take up to 60 minutes. Let cool on rack and then un-mould if using a bundt pan. If using a 9x13 pan, you can choose to add the cinnamon pecan filling as stopping instead. Add ½ cup flour and melt ⅘ tablespoons butter, mix together and sprinkle on top. Also, if you are at high altitude, the cake will come out better if you use only 1½ teaspoons baking powder (this is what I used but sea level bakers will need the extra lift of the additional ½ teaspoon). This cake will work with different pear like fruit and berries, my apple blueberry was very similar. So, I hope you are all having a great week. I’m putting on my positive hat and getting through it. I’ll be catching up with my reading tonight, I know I’m behind visiting all of you guys’ wonderful posts. Thank you Kate for your kind words! I really appreciate your support. Initially I was drawn to this post because of you beautiful pics and this delicious looking cake. This is my first time visiting your blog so I don’t know what you’ve shared, but your heartfelt words today have touched me. I sincerely hope and pray that you overcome all the hurdles you have with your illness. It sounds like you are surrounded by a wonderful support system and I hope you can draw strength from them to help you get through this tough time. Thank you Tina for coming to the blog and for leaving such a thoughtful and kind comment. I appreciate you taking the time to read my ramblings and leave a comment. I have a lovely set of friends at home and online and am really blessed. I hope to see you around, thank you. This is a very late comment (I’ve been offline last week), please don’t give up. Your blog is wonderful, I’m really glad I’ve found it. Sometimes, it can be hard to find the time or inspiration, but it is worth it, I think, if it’s something you enjoy. saucy gander recently posted..Is it a cookie? brownie? double chocolate dog bones? Thanks you so much for your kind words! It’s hard sometimes but I don’t think I could give it up anytime soon. I have too much fun meeting wonderful friends like yourself. Thank you so much for your lovely comment Kumar. Oh darling, I’m sorry you live with chronic illness, it must be awful. Its lovely to see you up and about once again in the kitchen, and your recipe certainly doesn’t disappoint! Thank you Min for your lovely comment. It is hard to get inspired sometimes and especially when you don’t feel 100%. But I will continue! I enjoy it too much 🙂 Thanks for stopping by Min. SO sorry you aren’t feeling your best. Hang in there and don’t give up. Take a much needed break from your routined life and comeback, refreshed. It’s always needed and recommended. Thank you Kiran. I agree and i will heed your advice. I think I am a bit burnt out. Thanks for your support. Dear Nazneen. although I am also rather new to your blog, I so love to come here and look at all your utterly amazing photography and recipes!You are a very, very gifted person and I would love for you to continue this blog – but some days blogging can be overwhelming (I often thought of giving up too because it does take so much time and energy), especially when we do not feel well – I sincerely hope that you will feel better this week and take enough time to rest! In the meantime, you probably already know that this is my type of cake – I love these “European” style Bundt/Gugelhupf so much! And we share another passion, I am a very serious coffee lover too! So a slice of this cake, please and a nice cup of really good coffee (as soon as you are feeling better. of course)! Sending you hugs and lots of positive thoughts from afar! Thank you Andrea! I am so glad we have become friends and I’ve discovered your blog too. You bring a piece of home back to me because I miss Europe and my home. Thank you for your support, my friend. Thank you Bam for your words of encouragement and support. I agree totally with you and will take your advice, as you know, its very hard with children who always need something from you. So sorry you’re not feeling well. Pain can make even things that always give you pleasure feel like a chore. And blogging already has its chore-like aspect (although I ignore those because it’s so much fun! ), so I can see why you’d want to rethink your commitment to blogging. Hope you continue – you’re good – but you’ll of course make your own decision. Anyway, great recipe – glad you took time to share with us. Thank you John for your very kind words of support. When you live in pain, it just overwhelms you sometimes and its hard to get out of the funk. I try not to get so low and don’t usually but this time the pain has persisted. I’ll be fine, I am beginning to feel better. Thank you so much John. Woww.. looks simply amazing and tempting.. awesome pictures too!! Hugs and eat lots of this cake to feel better – welcome back! Thanks so much Uru. You are very sweet. Blogging definitely keep you occupied but it is an amazing hobby. I do get thoughts of leaving the whole blog thing but after some time they go away and people like you keep me going. l love this cake with fruit and nuts. Thank you Balvinder, and its definitely friends like you that help me continue also. Nazneen. I know I haven’t been reading you for too long. But I also know this-you are an awesome mother and sister and seem like a great person with so many talents. You will persevere-I know it! Just like this cake is a winner-you are a winner, too! Everyone has bad days- if you read my blog long enough, you will know that to be true. Take care, tomorrow is a brand new day. Thank you Abbe for your kind words. I know I will, sometimes it’s just really hard. So sorry to hear that you are going through a “bad patch,” as some people say. I hope your episodes don’t last very long and are far between. Is there any rhyme or reason as to when they come and when they go? Probably not. I have something mysterious going on in my body, too, just lots and lots of severe joint aches that come and go without warning. So….I know how frustrating it can be to just not feel well at all and to be in pain all the time. I am finally going to see a specialist about it. But…..I know nothing could be as difficult as RA. I hope you are feeling a lot better now. I am glad that you decided to carry on with your lovely blog. Your pear and blackberry cake reminded me that last Autumn I discovered a recipe for a pear cake on a food blog but had forgotten about it and had not made it recently. Maybe it was your blog? I just don’t remember. Anyway, my husband loves blackberries so I think I will try your recipe for Thanksgiving dessert. Thanks! Thank you Caterina, I am better but I have my off days. If they last too long then thats what is hard to handle. Thank you for your words of support and encouragement. Awww, hope you feel better my dear. I totally understand what you are talking, moms are super humans according to kids and hubby. It’s tough, sometimes, feels so empty even when everything’s going great. Chronic pain is not a great thing at all, I’ll pray that you get better. But, this phase is just a passing one, we are here, we go through the same, we will be there to pick each other up. Apart from that, hey this cake is awesome, has some great things going on. Love it. You are doing great, your recipes and creativity are great. I am sure your kids must enjoy all the lovely cooking and baking. BE strong and positive. FYI, I’ve been going through a blah phase too, I think it’s the holidays, too many things and it can get overwhelming. Thank You Asha. Your wonderful words and support have made me feel so much better.Thank you. Can we talk about that Cinnamon Pecan Filling and how amazing it must taste and smell? Gorgeous! Nazneen, I opened this up and I thought “what a beautiful cake” and didn’t realize the post would get a bit serious. I’m sorry to hear you’re dealing with a chronic illness. I can’t imagine what you’re living through but I hope that you do what makes you happiest and I hope it involves continuing to blog and chat here. I haven’t been here long but the food you make looks so great; I know it brightens up my day to see it. I wish you all the best, and continued good eats. This cake does look wonderful. I’d be happy to have it during the holidays or anytime. This *is* original (…sometimes being ‘original’ can be over-rated anyway) – I have some pears in the fridge as well and I wish I was as creative as you are – take care! Thank your Monica for your wonderful words! I have enjoyed getting to know you through your blog and through the comments here. I’m not giving up quite yet! It just feels very overwhelming when you are dealing with pain on a constant basis. But, I’ll get through it with support from wonderful friends like you. Thank you so much Dixya! I agree, and I think I wrote this post to hear these wonderful words of wisdom. Sometimes you need the encouragement from others who do the same thing. I appreciate your kinds words. Delighted to see that you mingled all those organic goodness and freshness into that perfect looking cake. Two thumbs-up! Love the way the crumbles are showing up in the photos…captivating! Thank you Nusrat for your kind words, your hugs and most importantly your duas. That’s all I need to get through the bad times. I appreciate your friendship. Thank you GG, my friend. I’m doing better but it’s hard to get motivated sometimes. Thoughts of giving up go through all the time, but I don’t think I ever could! I have too many good friends and too many ideas! You bake like a dream. I can look, and droool at the pictures. Then look some more. And then droool some more. Right now, you have no idea how much I am craving a piece of this cake, and I don’t even like cinnamon in cakes. I am sipping some warm English breakfast tea….and feeling those pecans go crunch…. Hi Nazneen, I don’t care about this cakes originality or not. The flavourings are to die for and the novelty shape make it even more tempting. As you say in your post, we will never understand exactly how you’re feeling. All I know is that I’ve had a headache for two weeks and the last thing on my mind was blogging. I look forward to your next delicious post. David Crichton recently posted..Slow Roast Beef with Blue Cheese Croquettes. Thank you so much for your lovely words David, I appreciate it. I hope you are felling better and that you’re headache is gone, please get it checked out, that’s usually not a good thing. Nazneen – although we are just new “blog friends,” I do feel as though I have known you longer. And now I worry. Do take care of yourself and know how much we appreciate your energy and commitment. And how much I LOVE this cake. I think it is truly inspired! Be good to yourself! Thank you so much David! Your comment made my day and I agree, though I’ve just found your blog, I feel like we’ve known each other longer, and I’m so glad! We all have spells when we question blogging as it does take a lot of time. I can imagine it even being harder when you don’t feel well. Hopefully you don’t give up your blog…if need be, just post less frequently. 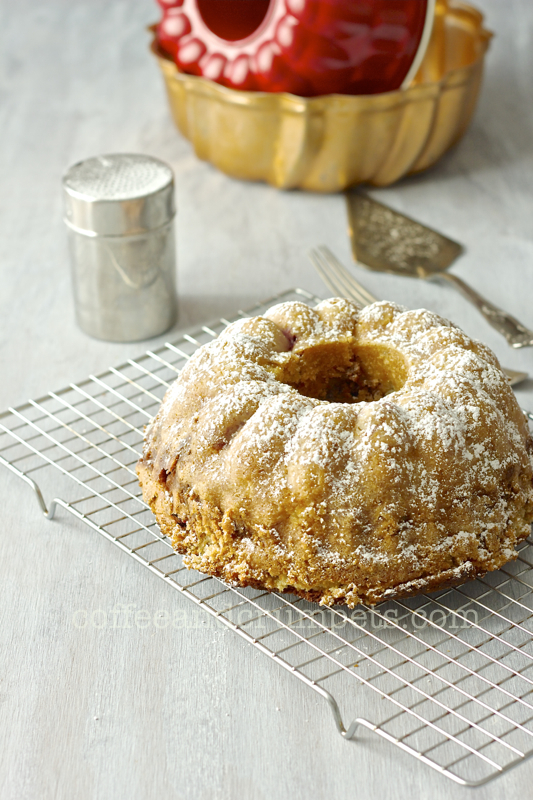 I love a bundt cake like this, especially with the fruit and nuts. I’m sure it is delicious. Thank you Karen for your kind words. You’re right, I should post less if I get overwhelmed but that’s me though, I hate to change anything! I like doing this and I probably won’t give it up anytime soon, but it does take a toll, especially if you don’t feel well. I love its flavor profile…as well as how moist it looks! I am so sharing it, Nazneen! I am so sorry yo are unwell – and I am so glad you are not giving this up! This cakes looks so good – and the cinnamon pecan filling! Good gawsh – I would have liked a slice ofthis instead of my oats this morning. I hope you have a good day…and I hope your good days outnumber your bad ones. shashi @ http://runninsrilankan.com recently posted..Something Truly MIMM-and Everyday! Oh Nazneen…very sad to read this! Your recipes and all the hard work you do on your website is just SO amazing like you are. I understand what you mean…it does require tremendous drive to go on month on month with our ongoing responsibilties. But at the end of the day..it means the world to us…my blog is like my baby. I go through low phases too but my blog keeps me going. And you are so good at this! Look at the cake…so elegant…the flavours have been beautifully combined. Wow..love it! Please don’t even think of giving up..I cannot imagine the blog-o-sphere without my dear friend. Oh I’m fine now Sonali! As much as I may have those thoughts, it will take a lot more for me to stop. I do feel overwhelmed when I don’t feel good and it’s just frustrating for me I guess. Thank you so much for your wonderful comment, my dear friend.